Ignazio Gardella was one of Italy's most important and influential architects and designers in the 1900s but very few people are familiar with his first work - the church of the “Sanatorio Antitubercolare Vittorio Emanuele III”, the old tuberculosis sanatorium, now the “Centro Riabilitativo Polifunzionale Teresio Borsalino”, a multipurpose rehabilitation centre in the city of Alessandria, Piedmont. Ignazio Gardella was one of Italy's most important and influential architects and designers in the 1900s but very few people are familiar with his first work - the church of the “Sanatorio Antitubercolare Vittorio Emanuele III”, the old tuberculosis sanatorium, now the “Centro Riabilitativo Polifunzionale Teresio Borsalino”, a multipurpose rehabilitation centre in the city of Alessandria, Piedmont. During the open days organised by the National Trust for Italy (FAI - Fondo Ambiente Italiano) a few weeks ago, it was open to the general public for two days. 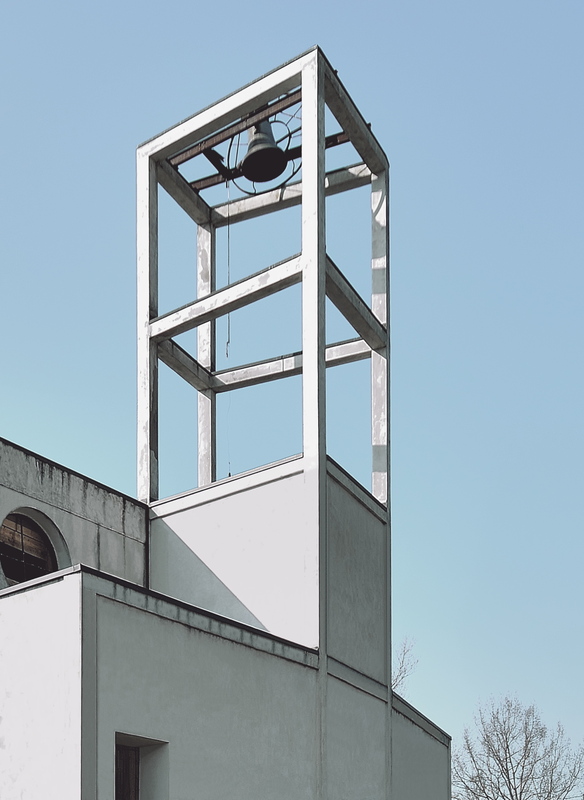 A fleeting moment captured by photographer Gianluca Giordano, who has been travelling across Piedmont for years to immortalise its 20th-century architectural heritage (Olivetti, Nervi, Gardella), which we publish here in preview.. This small building, located in the park next to the present-day rehabilitation centre, is an early, fine specimen of rationalist architecture designed by Ignazio Gardella built between 1929 and 1930, at the tender age of 24. At this time, he took over the commission of his father, Arnaldo Gardella to construct the Vittorio Emanuele III tuberculosis sanatorium in the Piedmont city. Actually, the relationship between the Gardella family and Alessandria dates back to 1900, when Ignazio's father, Arnaldo won the commission to expand the mental asylum and continued until 1996 with the restoration of the tuberculosis dispensary, overseen by Iganzio, who had originally built it sixty years earlier. Over a 100-year period, father and son constructed a legacy of fine quality works that demonstrated the changes that Italian architecture went through in the 1900s. Efforts are now being made to bring them back to prominence. The tuberculosis sanatorium was financed by the famous hat businessman Teresio Borsalino, who was also very active in the social realm, a bit like the actions of Adriano Olivetti in his Ivrea. The sanatorium was opened in 1936 and is an iconic example of the nascent rationalism in Italy, being completely devoid of decoration, with flat roofs, box-like and cylindrical shapes, the large windows and the corner windows. This complex was a real “healing machine” and after it was hard hit by the November 1994 floods, it was completely rebuilt and turned into a rehabilitation centre in December 2006. This complex also includes the small church, the very first work of Ignazio Gardella, with a revolutionary floor plan based on a parabolic shape, and the iconic bell tower, with its trellis structure as a manifesto of the new way of “constructing architecture”. The church interiors are distinguished by a tight symmetry and a division of the nave to meet the requirements of the era, where men and women were kept separate. The altar is lit from above by a round skylight, a design solution that we can still see today in many examples that we have shared on our pages. With the National Trust for Italy taking an interest, this small gem of rationalist architecture was opened to the public for at least two days, until it can be refurbished, returned to its former glory and once again perform its function as a church.